They eat, drink some wine, roll in the grass… And go home covered in love bites. Well, I don’t know who came up with this, but it ain’t happening where I live. Here is the South, the only bites this couple is going to go home with are chigger bites. Chiggers are mites from the family of spiders and ticks (arachnids). They are red and so tiny we can’t see them with the naked eye. Chiggers live in moist areas around lakes, rivers, and ponds, or close to ground level in grassy fields, gardens, and forests because they need humidity in order to survive. Chigger bites a couple of days old on the back of the leg. Chiggers will climb on you even if you wear shoes and long pants or they will climb on your arms as you work in the garden. Then, they will migrate all over the body in search of the perfect spot to bite. Once they found a juicy spot, they will insert their feeding tube into your skin and inject enzymes that cause destruction to the skin. They then, feed on the damaged tissue. They don’t burrow into the skin as many people think. The itching is horrendous and once you scratch the spot you squish the chigger to death. But the itching stays f.o.r.e.v.e.r. Most of the time, you’ll see the bites behind the knees, in the crotch area, under the arms, or around the ankles. Those are areas of the body where the skin is thin and it is easier for the chiggers to insert their feeding structures. But as I write this, I have a few glorious bites on my tummy and other areas that are not mentioned above so although areas with thin skin are more common, you can still experience bites in other places. So how do you know if the bites you see on your body are chigger bites or mosquito bites? Many times, you’ll see a cluster of little red bites in a certain area. They might be small red dots or bigger, like a mosquito bite. But other times you’ll have a bite here and a bite there. As opposed to a mosquito bite, you won’t feel the chigger bite as it happens. About 1-3 hours after the chigger injected it’s digestive enzyme the symptoms will occur. Many times you’ll find the red bumps in areas that were covered with clothes, not exposed areas that mosquitos can reach. And the itch of a chigger bite is much worse than that of a mosquito bite. It lasts for a few weeks instead of a few days. Chiggers, at least in North America, are not known to carry any diseases, and the bites themselves do not produce any long-term complications. However, since the itching is so intense, you mast be careful not to cause yourself wounds by scratching, those open wounds can sometimes get infected by bacteria. How to Prevent Chigger Bites? The first is that I personally did not try all of these suggestions bellow. I collected them from country friends that have some experience with chiggers. I tried a few, and I will note the ones that I did try and worked for me and at the end, I will tell you our before-you-go-outside routine. The second thing you have to know is that not all the solutions you’ll find here are healthy for you. For example, to spray yourself with kerosene is obviously not healthy for your skin and is not good for you to inhale. However, if I must go clear an area with two feet tall vegetation on my property on a summer day, I’ll probably do it. Maybe if you ever had to deal with a hundred chigger bites on your body at the same time, you’ll do it too. Mayeb not. It’s your decision to make. The third thing you should know is that not all the solutions bellow might be safe for your other animals, plants, or young children. My goal is to simply give you all the options I know of, it’s your responsibility to make sure they are safe for your situation. 1. Wear pantyhose under your pants – some say that the chiggers can’t bite through the pantyhose. make sure to wash this pantyhose very well in hot water once you take it off. 2. 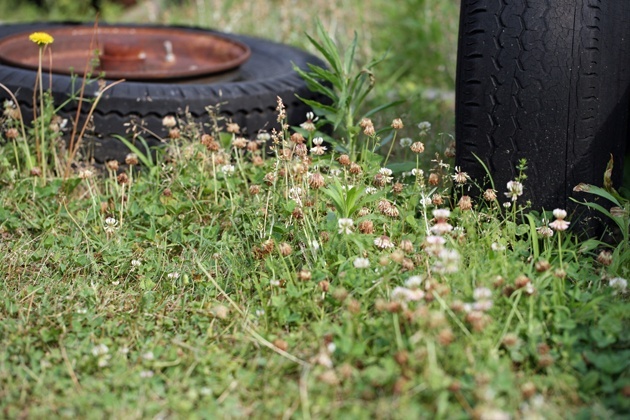 Keep grass cut short and your yard clean – make sure to cut the grass on your property short from early spring until Fall when temperatures got under 60F. 3. Dust diatomaceous earth on clothes – chiggers don’t like this stuff I heard. Before you go outside, dust the lower part of your pants and shirt sleeves with some DE. 4. Spread diatomaceous earth on your lawn – another way you can use it is by spreading it on your lawn. Use 5lb per 1000 sqft. 5. Vinegar – I didn’t try it, but since vinegar can pretty much save the world I am sure this will work. Spray your clothes with vinegar before going to work outside. 7. DEET – others say you’ll have to go 98% DEET for it to work. 8. Turpentine – spray your clothes with turpentine before going outside. 9. Vick’s VaporRub – apply the ointment on the lower part of your legs and on the arms. 10. Plant Marigolds – apparently, chiggers don’t like marigolds. You kill two birds at once here, your garden will be both chigger free and pretty. 11. Plant Horsemint – another beautiful plant that will keep the chiggers away. 12. Mentholatum ointment – apply on ankles and lower legs and also on arms. 13. Spray kerosene – spray kerosene on clothes before going outside. 14. Skin so Soft from Avon – this is one of the things I tried that really works. It smells good but bugs in general don’t like it at all. I also put this on my kids. 15. Bag Blam – apply on lower legs and arms before going outside. 16. Garlic – just like vinegar, garlic can save the world. Eat one clove of garlic a day and chiggers and mosquitos will stay away. Your immune system will be very strong too. 17. Dust clothes with sulfur powder – this seems to be what most people will stand behind when it comes to dealing with chiggers. Dust this powder on your clothes and shoes before going to work outdoors. 18. Spread sulfur pellets – spread pellets on your lawn. use 5lb per 1000sqft. The suggestion is to do this around the end of May before temperatures get too hot. 19. Sulfur supplement – add sulfur to your diet and the bugs won’t like you. 20. Lemongrass essential oil – apply topically on the lower part of legs and arms. 21. Lavender essential oil – apply topically on the lower part of legs and arms. 22. Geranium essential oil – apply topically on the lower part of legs and arms. 23. TerraShield essential oils blend from doTERRA – I love this blend, it works great for mosquitos, ticks, chiggers and whatever else is out there looking for a taste of your blood. It is natural, and I use this for my kids too. We spray it or spread it topically on our bodies before going outside. **If you would like to learn where to purchase the best essential oils for wholesale prices, check out my essential oils page. 24. Rubber bands – place rubber bands on the ends of your pants by your ankles and the end of your sleeves by your wrists. This will prevent the chiggers from climbing and taking a walk all over your body. 25. Bug B Gon– Bug B Gon might help control the chigger party on your lawn. 26. Guinea hens – this is a controversial topic. Some people say that chiggers are too small for the guinea to find and eat, others that raise guineas say they don’t have any kind of bug problems on their lawns so maybe the guineas do eat the chiggers or simply scare them away. Anyway, guineas will take care of ticks, fleas, caterpillars and so on so they are a great addition to your homestead. 27. Rub hands all over your body – before you come inside, rub your hands up and down your body to kill any chiggers that are on you and didn’t bite yet. We just moved to a new house in the country. No one lived here for years but the chiggers so we have quite a war to fight. First, we are going to try to treat the lawn with Bug B Gon just to get the situation under control. In fact, we did this a couple of days ago and it seems to work pretty good. Note, I do not have a garden growing here at the moment and we do not have animals here right now. I read that you should water the area or spread before the rain to make sure the product dissolves into the soil before allowing pets back on the lawn, but again, I don’t have animals here at the moment so I didn’t spend too much time researching this. Next, we might use diatomaceous earth or/and sulfur pellets to make sure they don’t come back and I am now working on getting the coop ready for a few guineas. I can’t say that we are very good when it comes to wearing shoes but we usually have long pants on and sometimes long sleeve shirts with rubber bands at the ends. We use Skin so Soft and TerraSheild. I apply it to our skin every two hours alternately. I’ll apply Skin so Soft and then two hours later TerraShield and will keep doing this for as long as we are outside. It seems to work great. Chigger bites four days old after three Epsom salt baths and other remedies. Let’s say you accidentally fell into a field infested with chiggers. You rolled around a bit and now you are covered with chigger bits. You are going out of your mind, swearing you are never going to step outside ever again, and by the end of the first day you are ready to move to heaven where, most likely, there are no chiggers. 28. Vicks Vaporub – apply on bites. 29. After Bite – apply on bite as directed. 30. Ssssting Stop – apply on bite as directed. 31. Vinegar – use a cotton ball to dab vinegar on bites. 32. Baking soda – mix baking soda with a bit of water or coconut oil to make a paste and apply on bites. 33. Aloe vera – good old aloe vera can help heal the skin. It might help with the itching only a little bit but it will definitely help the skin heal faster. It’s best to use your homegrown aloe vera, but if you don’t have a plant you can get aloe vera gel here. 34. Comfrey ointment – comfrey leaf has many skin healing properties. Apply to skin as directed. 35. Baby oil – some say applying baby oil on bites helps with the itch. 36. Nail polish – many people suggest applying nail polish onto the bites. It is based on the misconception that chiggers burrow into the skin, and so by applying nail polish you suffocate them, but chiggers don’t burrow into the skin… Still, I’ve tried it and there is something in the nail polish that does help with the itch and also seems to dry the bite rather fast. 37. All Good Goop Organic Balm – this product was recommended to me and it looks promising even though I didn’t try it yet. 38. Calamine lotion – apply as directed. 39. Chiggerex – might be a bit more geared towards chigger bites… Apply as directed. 40. Benadryl – Benadryl tablets for adults and Benadryl liquid for kids. Take as directed. 41. Benadryl cream – apply on the skin as directed. 42. Orajel – apply on bites. This will help with the itch by numbing the area. 43. Epsom Salt – add Epsom salt to a warm bath as directed and soak for 20 minutes. 44. Epsom Salt cream – apply on bites. 45. Lye Soap – scrub your skin good with old fashion lye soap. 46. Bleach – add one cup of bleach to the bathtub and soak for 20 minutes. I know, it sounds awful but some people say it really helps. I haven’t tried it yet. 47. Essential oils– last but not least, my beloved essential oils that I turn to for just about anything. To support a healthy skin and help with itching you can use lavender, melaleuca, peppermint, rosemary, eucalyptus, basil, and thyme. Some essential oils need to be diluted before applied topically. To handle the first couple of days we use Benadryl. My husband and I can usually handle the itch but if my kids have “accidentally” rolled around in chiggerville and are covered in bites, I give them kids Benadryl every 5 hours for the first couple of days. We soak in an Epsom salt bath once or, preferably, twice a day for 20 minutes. This really helps to dry the bites, but it takes around three baths until you feel the difference. We use essential oils, Benadryl cream and Chiggerex for the itch and aloe vera and essential oils to help heal the skin. The reality is that country living is not always as romantic as it sounds. You got to deal with creatures that you don’t find in the city. I remember watching an episode of Alaska The Last Frontier a while ago. I was looking at the amazing views and the way of life those people have and I was thinking how amazing it all looks and how I would like to live there, like that, too. Then, all of a sudden they filmed one of the guys there standing in a swarm of mosquitos, trying to breathe without them going in his mouth. He explained how, because everything is so moist in the Summer when the ice is melting, they need to deal with gazillions of mosquitos. If there is one bug I hate just as much as chiggers is mosquitos. Suddenly the view wasn’t that amazing anymore. But if you are anything like me, you’ll take chggerville (or mosquitoville) over too-many-peopleville any day. So at least now you have a few things you can do if you happen to live in or visit the village. Did I forget anything? Tell me in the comment bellow how do you deal with chiggers. Aspirin dissolved in vinegar. Make a paste and dab on with a cotton ball or just dip the aspirin till it starts to dissolve and rub on bites. Apple cider vinegar is best but white will do. I’ve tried all your other remedies and none of them work as well as this. Works on other itchy bites too. That definitely sounds like something that will work. I’ll try it. Thanks. we have a place in mid central illinois. This is where I first discovered Chiggers. AHHHHH!!! I will itch myself to death. I don’t know about pantyhose under my long pants on a 90 degree day, but I will try some of the other suggestions. I haven’t tried the skin so soft in a while so I”ll let you know what I have luck with! Please do. It is interesting to see what works for different people. Our go to remedy is to make a paste with lye soap and a little water to coat a bite. Another thing that seems to work is denerex shampoo as a lotion. This helped me out a lot.. My mom has chigger votes on her an I couldn’t figure out what had bit her neither could she but looking at the pictures you posted they look identical to the votes on her arm… An she complained about how had they itched her.. So I brought her son benadryl cream an she said it helped.. I had never seen a chuffed bite untill she was biten… Thanks for the info now I know what I’m looking at an how to help her if she gets bit again.. I pray she doesn’t. .
My phone typed votes instead of bites… Stupid smart phone..
Oh, my phone does this all the time. No worries! I hope your mom feels better soon. I have found that rubbing the bites with some peroxide helps with the itch. I am going through this right now. Guess I got them working in my garden. I am covered in chigger bites too at the moment. We got them under control here around the house, but I went to work on the farm (across the road) a couple of days ago and came back covered. I’ll try the peroxide. Thanks. I live on a chigger (and everything else thorny, venomous or toxic) infested 68 acre farm in Texas. Of course I am one of those people that can find chiggers on a single blade of grass. In December. Forget the pantyhose. They will simply climb the pantyhose like sailors on rigging, until they find succulent flesh, say around your waist. I am a beekeeper and can’t use scented anything around my bees. I wear long pants tucked into rain boots most of the time, with DEET sprayed on my waist and ankles if it’s an all day affair. Powdered sulphur does slow the little fellas down too, but they just cluster at your ankles and have a feast. Are you able to use Bug-Be-Gon or DE or the sulphur on your land with the bees around, or will it harm them? I am planning for a couple of hives next year so I’ve started researching. I am planning on having chickens and guineas roaming around too so I hope they will take care of the problem for me. Ummmmm… thats a picture if a flea. 6 legs. Chiggers are arachnids. 8 legs. Might want to change the graphic on your article header. Oh! You are right. It was listed as a picture of chigger and I didn’t look at it too closely I guess. It’s really hard to find a picture of one to buy. I’ll look for another one. Thanks for pointing it out. Juvenile chiggers, the ones that bite, do have 6 legs. The adults have 8 legs. Currently enduring a bad allergic reaction to 6 chigger bites from 3 days ago. I have been doing so much research. Thanks, Mary. I hope you are feeling better. If you’d like information on how essential oils can help you with allergies please don’t hesitate to contact me. I’ll be happy to share. I use Skin So Soft before I go out but if I get chigger bites nothing helps. I have to scratch til it quits itching. Thanks for this. Just came back from a short mountain visit in the southeastern part of the US and came back with at least 100 chigger bites per arm. I counted 10 bites in a 2×2 inch area. Soooo miserable. Only spent a few hours in the area and now I’m hesitant to show my arms wherever I go. It looks worse than the chickenpox! I suppose I can wear longsleeves when I’m out and about, but that would only irritate my skin even more especially in this hot weather. I’m currently taking Benadryl and applying Hydrocortisone cream. Applied Lavender essential oil, all to no avail. I will try the other treatment suggestions… again, thank you! Oh no. I hear your pain. Keep the Benadryl going for a couple of days and if you can I really recommend Epsom salt baths, like three a day if you have time. It really helps healing the skin. The Epsom salt baths do help some. I spray my legs with vinegar prior to going outside. Also, I spray the dog who is also otchy. We live in a wooded area. The vinegar seems to help his itchiness as well as mine. He doesn’t like being sprayed though.Benedryl helps too. Thank goodness fall is approaching. Seems like chiggers and bugs are really bad this ueat. Good luck to all people like me that bugs love. :/ Spray that vinegar and/or vinegar/water mixture! I rub baby shampoo on and it takes the itch away and also reduces inflammation. Thanks Iris. I never heard of this one before, I’ll have to try. Chiggers love me but won’t touch my wife. The one thing I found that helps, when you have been exposed to a chigger infested area is when you get home get out all your clothes and take a hot shower and scrub down good. When I was going through military dog training in Texas I would spray my fatigues with Deet, some guys used pantyhose. I would still get a few bites. However, on one brutally hot day when I got back to my barracks, instead of stripping and jumping in the shower, I set on the edge of my buck and fell back a sleep. I woke a few hours later with every square inch of my body covered in chigger bites. All great advice except the bleach. I live in NJ and only discovered these on my property lsdt year sfter having been here 12 years. Tbey must have come in tbe mulch i bought. My husband sprays now because he feels so badly for me. He never gets 1 bite. Tbey are tenacious and won’t come off except with tweezers. And must either crush them wuth the tweezers or drowned them in alcohol. I clean bite with alcohol and try not to scratch because I scar. I get itchy thinking about it. To stop the itch, use your blow dryer on the hottest setting you can handle for a couple of seconds. Move the blow dryer away when it gets too hot. Do this a few times. I know this sounds ridiculous, but down here in FL it works. Thanks for the tip, Cathy! Hot water in the shower does the same thing with poison ivy, but it didn’t work on my chiggers. They always end up in my bra. I only found Vagisil in my medecine chest, but it really helped. I cut pieces of moleskin and placed them over the bites on my hips and stomach and thighs. It stopped the irritation of clothing touching and the itch actually pretty much stopped. I left those on for about a week. That’s the best thing I’ve tried, in addition to spray on lanicane for arms and exposed bites. I went out all day to work on the yard and used Lavender essential oils on my ankles and arms in a coconut oil mix. No bites. Aren’t they magic?! I don’t go anywhere without my oils. 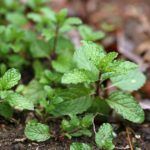 I plant Pepppermint, spearmint, lemonbalm, lemongrass and many other herbs. I’ve found this year the chiggers are fierce. I’ve been in the er with severe reactions. Almost superbugs. My experience was horrible so I beg you all to always wear gloves while handling plants. No matter how small the job. Thanks to evolution and mankind we have helped create a hungry resistant world of mites and no see ums. NEEM OIL… cold pressed virgin neem seed oil. I found a 16 oz bottle on amazon for around 18$(good deal-I swear by DE and Neem oil when it comes to healthier solutions) and I create a scrub using a few teaspoons of DE, capful of neem oil, dash of dawn, dash dr. bronners liquid castile soap, and a dash of coconut oil. I first dust my skin dry in the shower with DE. I then rinse with warm water. Remember your skin is going through so much with the bites and the extra scrubbing, inflammation, scratching and so on so be mindful to not over kill. The DE kills the mites and once they are washed I am sure to use the scrub neck to toe avoiding ladypart. I leave it on for a bit then rinse. Neem will help to repel as well. Do your research. Neem oil has much to offer. I do agree with witchhazel lye soap and apple cigar vinager as well to soothe. I am a farmers daughter and live in the thick delta. I can’t handle it anymore. These bugs are more abundant than ever it seems. i’ve never experienced skin issues before the last few years and for my and my pets sake I am headed west for a dryer climate. IMPORTANT….low sugars, eat lots of garlic-raw..must be raw to take full effect. Consider your diet and use your body as defense. Fresh foods, superfoods and fruits. Greens Greens Greens. I love love love neem oil. I also buy it from Amazon and I have a post on here about neem oil uses in the garden (look it up, I think you’ll like it. I did not, however, used it on my skin before. My husband bought me a neem oil mask but I didn’t get to use it yet. Since our chickens and guinea hens are free ranging in the yard we do not have any chiggers or ticks, but I still always have gloves, long pants, and my essential oils on me when I am working outside. I tried everything in the house, many that you named and they are better but resulted in many bruises from scratching. Oh Catharine, I know it’s awful. I’ll be happy to send you some essential oils that might help. If the itching gets really unbearable you can also take Benedryle. could you tell me if chiggers are also found in Australia. I live in the semi-tropics and thought I knew all the things that can make me itch. However recently I have been coming up with what look like little bites that itch like mad. They are not mossies or anything I am used to but looking at your site they look very similar and very itchy. I haven’t felt anything bite me and they just appear out of nowhere. Sounds like chiggers. So with chiggers, you don’t feel the bite and then after a few hours, you start itching. Then all those little red bumps show up and it’s going on for about three weeks or so. Have you been walking in long grass somewhere? Are the bites mostly on your legs? 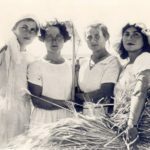 this was a really great article! i think I have a chigger infestation in my bedroom and all the bug spray has not been effective so far. I live in a 100 year old converted building with no lawn but across the street from the river. How do I get rid of the chiggers and how do I keep them away? Please help! i’ve already checked for bedbugs and sprayed plenty of flea spray, I can’t figure out what it is or how to get rid of it! i’ve been searching the web for months.. 🙁 the symptoms of the bumbs showing up many hours later,itching like crazy anf the locations you wrote in your article match the bites on my skin, and the pictures look very similar. i have some bites on my arms but mostly near my arm pit and base of my back. do you have an idea of what else it could be? if it is in fact fleas, shouldn’t have the spray taken care of it? Will fleas spray take care of bed bugs? I never had a situation like that so I am not sure. Can you see any bugs in your bedroom? Is it only in that room? The only other thing I can think about is allergy although in this case, the area will look more like rush instead of individual bites. Could you maybe have bedbugs? I live north of Toronto, Ontario Canada and I had heard of the “strawberry bugs” but didn’t realize what they can do until I was out blowing leaves the other day. After being inside for a couple of hours, I experienced extreme itching and all these red bumps showed up on my back and hip. My daughter took one look and said they were chiggers bites because her boyfriend gets them after haying. I took a shower and used Benadryl cream, but after reading this article, I’ve got a few more remedies to try now! Thank you!!!! You are welcome, Tamara! I hope you’ll have some relief soon. You can mix sulphur powder with baby powder for easy application. We used it in our ankles and lower legs to keep them from climbing us. That sounds like a very good solution! Thanks. I live in CA but I just recently got a kitty from Oregon (way out in the woods) and ever since my mom and I have been getting mysterious bites. I am pretty sure they are chigger bites as they seem to fit everything described here and they itch for weeks! I’ve never dealt with this before so I am assuming that it’s from being up there. I keep getting eaten alive IN OUR HOME! Have you ever heard of this before? HOW do you get RID of them from in your home? I wear neem oil to bed every night, vacuumed my bed, under the bed, washing all the linens and curtains and dusting everything. I’ve placed natural bug repellent bracelets under my sheets but I still get bit at night mainly but also during the day. The neem oil seems to work if you absolutely bathe in it but I absolutely hate the smell! So does my husband who is not getting bit somehow?!? I’ve been washing everything. Just gave kitty a bath. I’m at my wits end and and my mom and I are going insane! I read that they can live inside for 50-70 days without feeding. But they have been feeding lots and I think they must be multiplying because it’s been almost 6 months! Please help in letting me know how to get them out of our house! I’ve never heard of chiggers living inside. They are usually outside in the tall grass. When it comes to indoors, it’s usually fleas or bed bugs. Can you see the bugs? If you can see them, their actions might help you figure out what is it. First, if it is bugs of some sort and the situation is that bad, you might have to turn to chemicals. I hate saying it, but sometimes the natural stuff is just not strong enough. Second, whatever treatment you do, do it on a cycle. For example, once every 10 days 3 or four times. All of those bugs lay a bazillion eggs every day and you might kill the adults but a ton of babies are on their way to hatching. So repeat on a cycle. Third, can you actually see bites on your skin? Since your husband don’t have any problem, can it be that you and your mom have an allergy to something? Can you be allergic to the cat? Look at the pattern on your skin, is it a bite here a bite there or do you itch everywhere? I am getting the same bites as what looks like in this article. I checked my couch and beds etc. I see absolutely nothing. How to check if it’s actually chiggers or figure out something else it may be??? I don’t think there is a way to check if they are really chiggers. Chiggers are very very small. They also usually live outdoors… Can this be bed bugs? Are they bites or can it maybe be an ellergic reaction to something? I think the only thing you can do if you think it came from somewhere in your house is a deep clean. Just remember to repeat it three times every ten days to kill the baby bugs that are hatching. I thought I had bed bugs too, or scabies, or whatever. It’s really easy to bring chiggers into the home on your clothes. They love to hold on to cotton fibers and travel to other fibers in the home like furniture coverings. What worked for me is a bottle of bug spray next to the door, spray when I go out, spray when I come in. The picaridin versions smell much better than DEET and work just as well for chiggers. 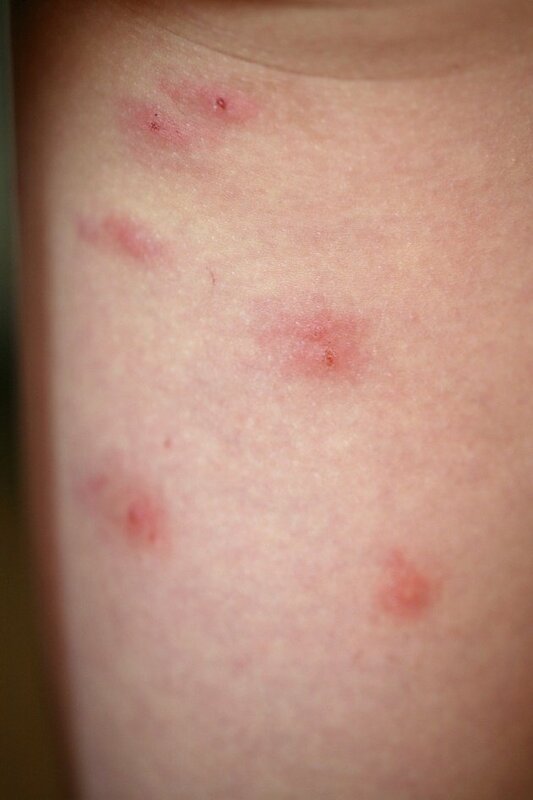 Believe me, I thought I was going bed bug crazy until I realized what an itchy nuisance chiggers are. They can be SORT OF controlled with regular bug spray and making sure to wash whatever you just wore outside, but I still get a bite or two. A couple times during the summer I will spray down my bed, cloth furniture and office chairs and I get no bites for days. Somehow they always come back to me for another bite. No, I can’t see the bugs, and the bites swell up like mosquito bites, but they have a little tiny blister in the middle unlike mosquitoes and last for weeks. then they scab over from all the scratching which is impossible not to. The only thing that helps the itching is Neem oil, but only a little bit. All the info I’ve read with my symptoms seem to add up to chiggers. I don’t know for sure, as I can find nothing – or not that I can see with a naked eye. My mom started getting them first, as she is home all day with the cat and I only started getting them about a month ago. They are terrible. I had a siamese cat years before, and never had an issue so I don’t think I’m allergic to the cat. 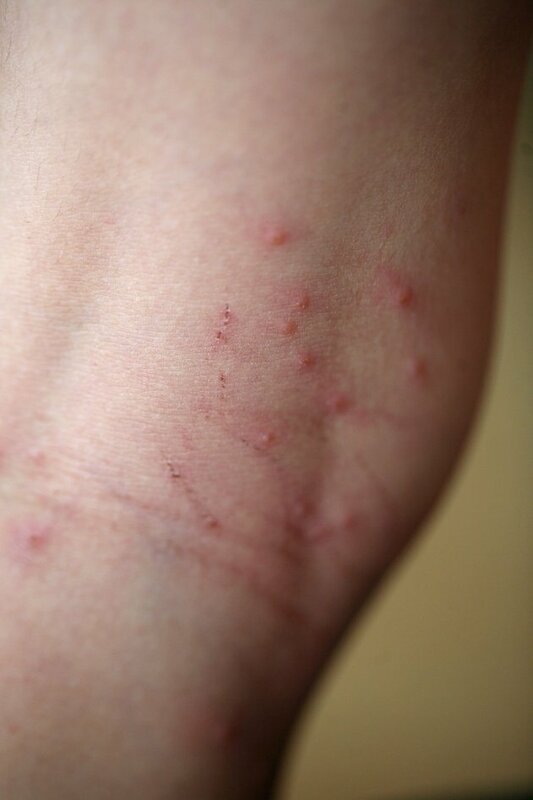 The bites are random but more clustered in the areas you mention, with thinner skin. I had vacuumed the bed, under the bed and everything in the room and it seemed to stop for a week or two but now they are biting again. I’ll take your advice and just keep cleaning and spraying stuff. Im trying really hard not to use chemicals but we will see. Thanks for your reply. If they go away for a week it’s a good sign. When they come back it’s probably more eggs hatching. If you see that it takes a week then I will do a deep clean every 5 or 6 day. If it takes two weeks, do a deep clean on day 11 or 12. I know it’s a pain but the bites are probably worse. Consider getting a cleaning lady to help you with it if it’s too much to do by yourself, I think it will be a good investment. I hope this goes away soon. I found out what they were: Rat Mites. We had a rat infestation in our attic, they had eaten holes in the AC vents and made nests in them. The mites were getting blown in when the AC came on. We had pest control come in and clean sweep the attic, replace the insulation and seal up any holes they were using to come in. Problem solved. Expensive! They must have come out of the hills when we had some bad fires last October. Goodness those were the most miserable few months ever!! But so relieved to have them gone and under control. Maybe some others on here experiencing bites in their home without seeing any bugs also have rat mites. They are almost invisible. I have never heard of rat mice before. Thank you so much for coming back to write this. I really appreciate it. Hopeful it will help someone else. Witch Hazel is my fave for stopping bug bite itch. Hello Lady Lee. I just read your article on chiggers and people’s responses. I had always heard to cover the bites in nail polish, but that doesn’t really work either. I was recently given a bottle of PURE CBD EXTRACT / CBD Hemp Oil Peppermint Drops, and I use it topically on areas on my joints for pain relief as well as take it internally to stay stress-free. So I thought : Why not try it out on my chigger bites (since the itching was driving me crazy ) and I applied 2 to 3 drops on each one, rubbed it in really good, and the itching completely stopped in 30 seconds. I applied it one time after my shower last night and went to work today and didn’t even have one single urge to itch all day, and I work a 12 hour shift. Don’t know if it will work on anyone else, but it sure did for me. And the CBD oil is fully legal. There’s No THC in it. I have just a little bit of experience with it but not one bites. I am not surprised it stopped the itching. It’s a great oil. Thanks for sharing this. 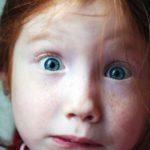 I didn’t see our family’s favorite anti itch remedy… Windex! Works best and almost painlessly if sprayed on the bites before you scratch too much. Kills the itch almost instantly from mosquito, chigger, midges, etc… Growing up, we spent almost every single summer day at Camp Fire camps or family camping and used a lot of Skin So Soft, ChiggerX, and After bite until Mom read the ingredients… Blammo… Windex had a lot of the same and came in a squirt bottle to ‘shoot’ wiggly kids ? Really!? That’s the first time I hear Windex for bites. Interesting. Thanks for sharing! Bleach works! A good old bath in Clorox will kick some chiggers but I do use more than a cup. It is what we in east Texas have done my whole 42 years for chigger treatment and it is right on. Also chiggerex works too!!! I live next to a creek and chiggers are a yearly occurrence. I keep a bottle of insect spray next to the door to spray on my legs and waist when I go out, and then spray again when I come in. Sort of a hassle, but after years of bites I found it works. When I DO get a bite, I apply ammonia as soon as I see it. Ammonia is in many “after bite” remedies and sort of spreads the toxins a little. The next day after I get the itchy boil, I put some of that liquid skin protectant that is used for small cuts. It doesn’t do much more than remind me not to scratch it, but after a week or two it has healed. I’ve tried everything else on your list. After years of chiggers this is what works for me! Thanks for sharing your experience! What kind of insect spray are you using? Just a regular one from the store or are you making it yourself? How could you not mention ” Chigarid “, in my opinion, a very effective after bite product I’ve been using for 40 years ? If your local drug store doesn’t have it, try going on line to search. It really takes the sting out of all kinds of bug bites. I like the suggestion you displayed about wearing rubber boots, but instead of tucking pants inside, how about duct taping each pants leg securely to the outside of each boot, smoothing the tape firmly against the rubber boot with no gaps for crawly critters. Go one step better and apply three bands of tape ( Gorilla brand has the stickiest adhesive) around your rubber boot shank, with the top and bottum bands having the adhesive against the boot and capturing the pants leg and the middle band with the adhesive facing outward to catch and hold the creepy creatures. You could try substituting highly adhesive fly paper for the middle tape band. Sounds pretty elaborate….. its practicalness depends on how much you hate being bitten. Could also work for bedbugs also if you wrapped fly paper around each bed leg and didn’t let your bedding drape onto the floor. If you sleep in a sleeping bag, your bedding will not likely touch the floor. Great tips! Thanks for taking the time to write this. I never saw Chigarid in our local drug store. I’ll definitely look it up! The only thing I’ve found to relieve chigger itching is baking soda combined with vinegar. You have to put it on frequently or the itching comes back. I do wonder if the stinging of the solution isn’t better than the itch tho. Thanks for the tip, Beth. I also find that sometimes it’s easier to handle one kind of pain than another. The worst chigger bites I ever had came after I followed a friend out to do gravestone rubbings in old cemeteries out on dirt roads in the country. Of course the grass was waist high. I hadn’t thought about chiggers since I was a kid. Boy, did I get them bad! After a couple of days, they were driving me crazy and I couldn’t even get to sleep at night. What worked? Absorbine Jr. It cooled the skin and calmed the bites. I’d get a couple of hours sleep and have to get up and do it again, but SO worth it! I have found that Tecnu works to sooth the painful bites of these little Chigger devils. Thank you for this. Never heard of this so I’ll have to research.